DUNCAN, Okla. – There are many things to describe Greg Simas. He’s a husband and father. It’s the latter that plays quite well in this community every October. For the third straight year, Simas will be the voice of the Chisholm Trail Ram Prairie Circuit Finals Rodeo, set for 7:30 p.m. Thursday, Oct. 18-Saturday, Oct. 20, at the Stephens County Arena in Duncan. “For me, being a fan of rodeo, the Prairie Circuit Finals is a mini-NFR,” he said of ProRodeo’s grand finale, which features the top 15 from the world standings in each event. “You’re going to see some of the best cowboys in the game – world champions, Wrangler National Finals Rodeo qualifiers and many that will be NFR qualifiers. Simas isn’t from this part of the world. He was raised in northern California and joined the U.S. Marine Corps. He now lives in Danville, Pa., with his wife, Jen, and their three sons, Tyler, Riley and Kaden. Rodeo is how he makes a living and supports his family, but there’s more to it. Simas is more than a fan. He returns for the second straight year as the voice of the regional finale, and he brings the emotion and knowledge to the game that fans in Duncan expect when they see the best of the best in action. It’s true, but it helps that Simas’ voice helps provide a championship feel to the competition and entertainment. Maybe it’s his years of service as a Marine, where he also learned to ride bulls. Maybe it’s that his father was a competitor in California. Most likely, though, it’s because of his love for the game. “Every rodeo I’ve worked outside of the Northeastern part of the United States, I’ve been asked to come back,” Simas said. “I’m very proud to have overcome the stereotype that people in that part of the country don’t know rodeo as well. The dedication and commitment I learned in the Marine Corps has kept me charging forward. While there are hours of homework on the contestants and livestock involved in the game, Simas has found joy in every aspect of his job. It’s a telling tribute to his passion. “Every announcer says that we have the best seat in the house,” he said. “I agree with that. For me, though, it’s like golf in a way. There’s nobody that could ever perfect it. 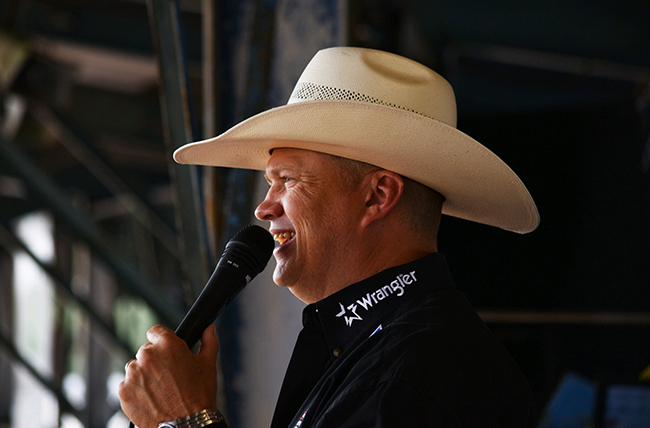 Those sentiments are why he has established himself as bona fide announcer in ProRodeo. His mentality and preparation make him the perfect fit for the Chisholm Trail Ram Prairie Circuit Finals Rodeo.